REPORT FROM THE ROAD: This past Saturday (January 19, 2019) a really lovely group of people showed up for my Asian market tour at the Mustang Market in Pinellas Park, north of St. Pete. Let me get right into describing some of the plant finds that we encountered. MALUD: Although malud fruits are not in season at the moment, two potted young plants were fortunately for sale at a Thai vendor’s booth. Tracy Love Tippens and I purchased these potted malud (Elaeagnus latifolia) plants for our gardens at $8 a piece. This lesser known fruiting shrub is native to Thailand and surrounding areas. It is in the same genus as the Russian olive and produces two inch red fruits covered with light silver-colored spots, as does the new growth. These fruits are somewhat sour and do not appeal to everyone. I relish them. Take good care of newly planted maluds as they are a bit finicky for the first year in the ground. Choose a shaded or half-shaded spot, top dress the surrounding soil with a decent amount of compost (and I mean decent!) or rotted manure, and do not let them dry out. A year later you will have toughened plants which I have seen grow into 12’ tall bushes of an ornamental nature. Bees nectar at the fragrant flowers. EGGFRUIT: We purchased some eggfruits for $3 a pound. These fruits are also known as canistel, and I shared some ripe slices with the group. This really is one of my five favorite fruits found growing in warmer parts of Florida. When the yellow teardrop-shaped fruits soften then they are ready to eat. The rich and creamy texture and appearance is very much like that of the yolk of a hard boiled egg. The flavor is slightly sweet and outstandingly good. If fruits are clean looking I wash them gently (many people remove the thin edible skin) and remove the large seeds, cut them up, and freeze them in wide mouth pint sized mason jars. The fruits that day has some sooty mold on the skin (appearing as a grayish-black powder), so I will peel these before eating and freezing them. They go into my creamy smoothies. In the wintertime Florida yields less fruits than in the summer, but the cool season fruits tend to be denser and creamier in texture. These wintertime gems include chocolate pudding fruit, eggfruit, mamey sapote, bananas, etc. Eggfruit is also wonderful eaten raw, made into raw pies, desserts, etc. MAMEY SAPOTE: Over the next few months another outstanding fruit ripens in warmer parts of the state… the mamey sapote!!! And we sure as heck purchased some. Another one of my favorite fruits, this football look alike is also ripe when it softens. The reddish flesh is similar to cinnamon pumpkin pie, while the huge seed and thick skin is not eaten. SAPODILLAS: I purchased a bagful of sapodilla fruits which remind one of pears in brown sugar when they are very soft and ripe. Know that occasionally a seed will have a small spine at its edge, so remove these large black seeds before consuming them. COCONUTS: Some attendees also purchased coconuts for drinking (and scooping out the soft inner “meat” if they returned the empty nuts for splitting with a machete at the vendor’s booth. JACKFRUIT: I purchased a large whole jackfruit, as did Camille. These behemoths are the size of infants and besides giving us delicious, chewy, “juicy fruit gum”-flavored flesh, they also give us large seeds which may be cooked and eaten along with edible rubbery “rag” which holds the soft fruit section (known as arils). The rag must be cooked for quite some time to soften its rubbery texture. I know some friends who turn them into a vegan pulled pork substitute which they top with vegan barbeque sauce. Jackfruits are grown and sold in the warmer parts of Florida but these beauties were shipped in from Mexico. Eric Lewis holding a Mexican-grown jackfruit. I paid $1.50 a pound for it ($28). Other local fruits for sale included LONGAN, BANANAS, and INDIAN JUJUBES. FRESH CULINARY HERBS AND VEGETABLES: Other fresh, locally-grown things to report include Ngo Om (Limnophilla, aka RICE PADDY HERB), LEMONGRASS, Tia To (aka VIETNAMESE PERILLA), Canh Gioi (aka VIETNAMESE BALM, Elsholtzia ciliata), LARGE-LEAF GOTU KOLA, KHILEK (Senna siamea), purple UBE YAMS, ROSELLE calyxes, WHITE CHINESE YAMS, BITTER MELON, PHAK SAMEK (Syzygium antisepticum) tender leaf tips, KRACHAI (just one basket of the rhizomes was for sale and was grabbed up quickly by one of our attendees who had only moments before mentioned that she wanted some), GALANGAL, (aka Kha, and yes… this is “Kha” of the famous Thai Tom Kha soup), various Curcuma species, YANANG (Tillacora triandra, the fresh leaves from this vine are massaged in water to yield a green vegan jelly), LOTUS stems, and so many more. CHAYOTE: Eric Lewis nearly freaked when he found some beautiful green chayote squash. This one of his favorite edible plants that he grows and he is always looking for new varieties of them. These vining squash are an amazing addition to any developing edible landscape as they scurry up into trees and drop ripe squash to the ground like gifts from the sky gods! Be sure not to let the roots stay too wet during our rainy summers, as they tend to rot. Gardeners at a nearby farmworker’s village mound up two feet of soil and then plant them beneath trees. Years ago, when I was in Mexico, the edible (when cooked) roots of chayote were sold by indigenous Mayans and were called Ichtnal (spelling?). CASSAVA: My favorite find of the day were some dwarf pink sweet cassavas for sale which had a very (comparatively) thin skin. Fortunately for us the woman and her daughter selling them also brought along 25 cent cuttings. I purchased all thirty of them from her and throughout the weekend, travelling around the Tampa Bay area, I gave away many to gardening friends. I will plant the remaining ones this afternoon. Score! TURMERIC: A number of us purchased fresh turmeric root clumps. I managed to obtain an especially orange-red-colored variety from my sweet friend Nid (one of the Thai vendors). I have named it “Nid” Turmeric in her honor as we have no idea which variety it is. GRASS JELLY LEAF VINE: Silly me, I forgot to purchase a rarely seen grass jelly leaf vine, Cocculus orbiculatus (aka Suong Sam), which is one of the vining plants (similar in appearance to Yanang but with more rounded leaf tips) that has leaves that can be made into a plant jelly… oh well, next time with luck. It’s a good thing that I know a number of the vendors after having visited now ten of their farmsteads, so I know that the fellow who had these jelly leaf vines is named Eric and was born in Thailand. I can always track him down and ask him to bring me one when next I see him. MEDICINAL PLANTS included BORAPET, a vining Moonseed species, the stems of which are used to treat blood sugar problems. HONEY AND ELDERBERRY SYRUP: The perennially kind Elisha Bixler (a friend who attends these tours regularly) sold us some of her backyard honey and homemade elderberry syrup after the tour! Yumster! After the tour most of us drove three miles to the Pho Quyen Vietnamese restaurant for lunch. The curried vegetable sauce was incredibly tasty, and I am one tough critic when it comes to fresh Asian sauces. I will create and post yet another tour of this, my favorite Asian market, sometime in March. This unique market includes almost twenty backyard and mini-farm vendors, mostly of Laotian/Hmong, Vietnamese, and Thai decent. One or two Cambodian or Burmese (Myanmar) vendors show up now and then as well. THANKS TO EVERYONE who showed up, I thought that this group was really wonderful! 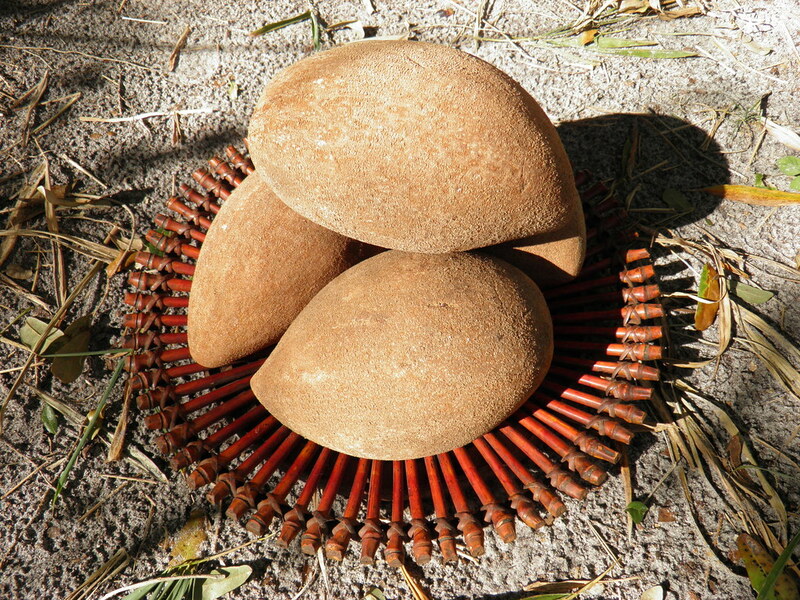 TOP PHOTO: Florida-grown Mamey Sapote fruits.